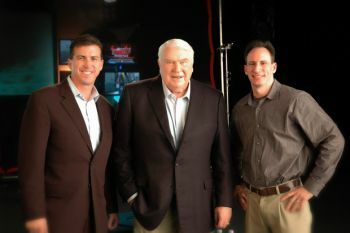 John Madden: "Growing Up in Daly City"
The following excerpt of NFL Hall of Fame Coach and Broadcaster, John Madden, is from the upcoming documentary "Daly City: Growing Up In America". On December 7, 2011 Kingston Media sat down with the legendary coach and broadcaster to discuss his life growing up in Daly City, California. We would like to thank Mr. Madden for his contribution to this historic film. We are currently producing this documentary film in partnership with the History Guild of Daly City/Colma. Any use of this footage is strictly prohibited and is solely owned by Kingston Media. Bob St. Clair: "My Life in Daly City"
Kingston Media in association with The History Guild of Daly City/Colma is currently in production on a documentary celebrating Daly City’s 100th Anniversary. This full-scale, professionally produced documentary film is a way to bring the City of Daly City’s 100-year history to life today and for future generations. Below is a vignette from Hall of Fame San Francisco 49er Bob St. Clair as he reflects upon his days playing professional football while serving as the Mayor of Daly City. Portions of this interview will appear in the upcoming film. NLF HOF QB Steve Young "Every 15 Minutes"
Kingston Media was honored to film legendary Hall of Fame San Francisco quarterback, Steve Young on March 15, 2011. Steve appeared at El Camino High School in South San Francisco as part of the Every 15 Minutes program, which educates our youth about the dangers of drinking and driving. Kingston Media has been producing content for this national program over the past 10 years. 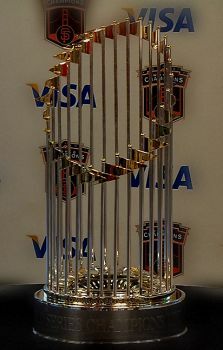 The San Francisco Giants very first World Series Championship Trophy was on display in the City of Pacifica, California on March 17, 2011. Check out this exciting highlight reel featuring throngs of Giants fans from throughout the San Francisco Bay Area. We documented the travels of the trophy (the only trophy we know of with its own specially equipped vehicle and security team...) and the joyous reception it received by delirious fans. 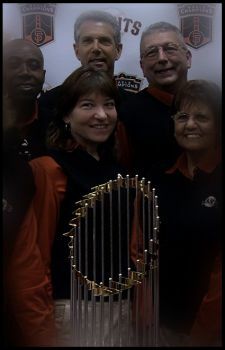 The Kingston Media crew took a stroll down the block to capture a once-in-a-lifetime event in South San Francisco—a visit with the very first World Series Championship Trophy for the San Francisco Giants. We documented the travels of the trophy (the only trophy we know of with its own specially equipped vehicle and security team…) and the joyous reception it received by delirious fans. We hope and expect to shoot next year’s ceremony after our beloved local boys repeat in 2011! Enjoy. 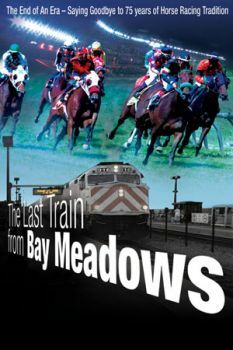 Kingston Media is proud to announce the premiere of “The Last Train from Bay Meadows” on Thursday, February 17, 2011 at 7pm. Produced in partnership with National Image Works, this full-length documentary features breathtaking images and poignant interviews as the history of the Bay Meadows racetrack in San Mateo, California is celebrated. The film provides an up-close and personal, behind-the-scenes perspective of operations at the track, and an in-depth look at its fascinating history and eventual closure. The film will be shown in the historic Fox Theater on Broadway in Redwood City. A reception and exhibit opening at the San Mateo County Historical Museum will follow. $10.00 film only and $25.00 for both the film and reception (RSVP required). Tickets are available online through the San Mateo County Historical Museum website, by phone, or at the museum.